Only the Lycoming factory delivers Cool, Hard, Tough, Genuine Lycoming Cylinders. The BEST Cylinders you can fly. Lycoming’s advanced metallurgical department engineers our cylinder barrels and heads for unsurpassed strength and performance. The nitriding process provides our cylinders with a thick armored protection that significantly outlives other hardening processes. Lycoming cylinder design dissipates heat quickly and evenly. 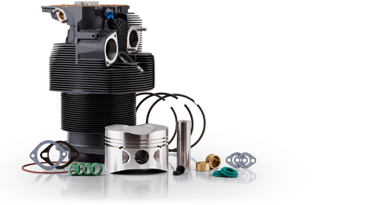 Lycoming cylinder kits come complete with a nitrided steel barrel, a new aluminum alloy cylinder head, piston pins and plugs, intake and exhaust valves, chrome oil and compression rings, valve springs and seats, retaining keys, and all gaskets and seals. ** O-235 series cylinders are warranted for 12 months.